Oh, ‘a pasta e fasule cu ‘e cozzeche! Neapolitans love this dish and with this guide, you’ll love it too. Why? Because this is the body shape tour and it helps you to taste this local speciality without fattening. Find how! Do you remember the refrain “When the stars make you drool just like a pasta fazool that’s amore”? Dean Martin was right about the classical pasta e fasule. That’s because this dish is a kind of a love story that starts in the memories of the Neapolitan food culture. 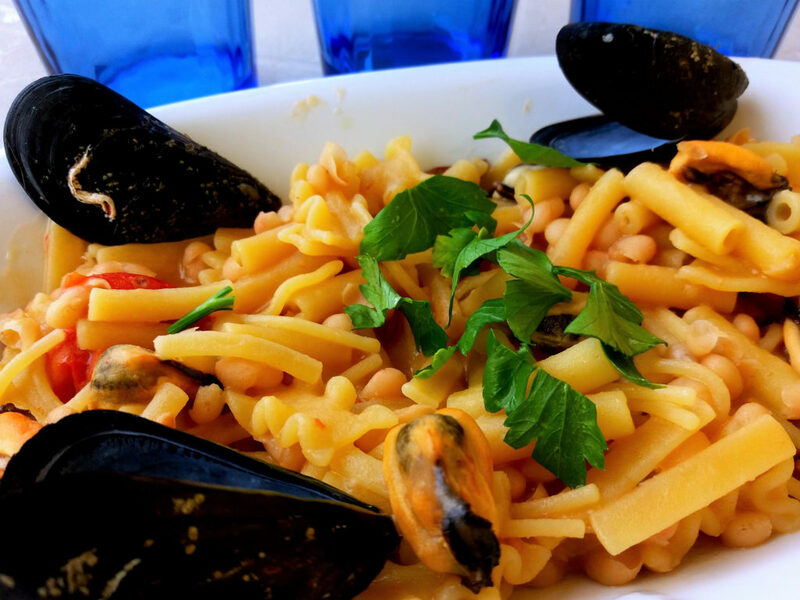 «Pasta e fasule cu ‘e cozzeche is a sweet memories of my childood: the summer dinners out of the terrace, the good smell of the mussels and of the beans cooked by my mother and my grandma». «I love to eat this local speciality in a restaurant by the sea and, if possible, end in style with white wine and peachs». «For me, pasta e fasule cu ‘e cozzeche means just one thing: the family». The precise origins of the pasta e fasule with mussels have not been determined; maybe, this dish belongs to the Italian rural cooking tradition with legumes, cereals and vegetables. Hence, in the popular culture, we use to say that it’s a Neapolitan creative dish both of the sea both of the earth because of the beans and the mussels. Furthermore, this meal has nurtured all italians since a lot of years, at most the lower classes. One of most ingredient is the pasta ammiscata, a kind of pasta, today very popular in all the world, obtained by the different stocks of pasta left-overs. That’s because the lower classes used to consume everything and nothing go to waste. Indeed, today, this dish is prepared with tubettoni and linguine, too. How to know better a place? Tasting its food. So, pasta e fasule cu ‘e cozzeche is a Neapolitan primo, a starter meal prepared with beans and mussels and a piennolo of pomodorini (a bunch). Pasta and beans are cooked together to combine the starch and the sauce. One of the best place to eat this local food is the restaurant Antica Capri, based in Quartieri Spagnoli. this dish is not a soup. 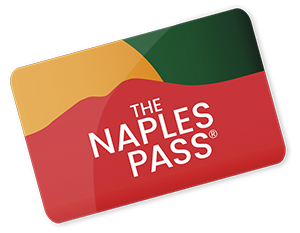 The sauce must be sticky; in Naples, we use to say azzeccoso. the sauce must be white and not red; use just a little bit of pomodorini. I am foodie. Indeed, while I have posted this article, it was tempting. So, I decided to prepare a pasta e fasule cu ‘e cozzeche with a recipe of mine. Of course, this is the body shape tour that I have programmed to fat burn calories of the pasta with beans and mussels. Are you ready? Let’s go. Start from via Speranzella, where there is the restaurant Antica Trattoria Capri, the ideal place to eat your pasta e fasule cu ‘e cozzeche. Via Speranzella is a little street that links Via Toledo and Quartieri spagnoli, so called because of the Spanish Presence in the the viceroy’s period. Santa Maria della Speranza founded by the spanish Juan de Lyria y Portacarrero and Francisco de La Cueva in 1540; this Church is the reason why Via Speranzella is so called. Keep going on Via Speranzella and enjoy the way of life of the Neapolitan vicoli with the hanging clothes, the religious shrines, the little shops; continue walking in vico Lungo del Gelso and turn in Piazza Carità and than in via Pignasecca. at most, in this place, there was the Pignatelli vegetable garden, where neapolitans cooked the “biancomangiare, a Greek recipe with rice and milk. Near the Pignasecca there is a funicolar railway, knew as “Funicolare di Montesanto” and opened in 1891. Most of the people prefer the railway, but you don’t. You love to stay in shape and doing some keep-fit exercises in holidays, too. So, you are settled with the Montesanto stairways. When you are in Corso Vittorio Emanuele:step by step, you fat burn calories of your pasta with beans and mussels enjoying a glimpse of Naples that lazy people never will. combinate slow steps and quick steps. keep going in Via Salvator Rosa. Head back, descend the path and leave Castel dell'Ovo. Turn left and keep going in via Partenope. Take the stairs opposite of you and you will find in Chiatamone Street. 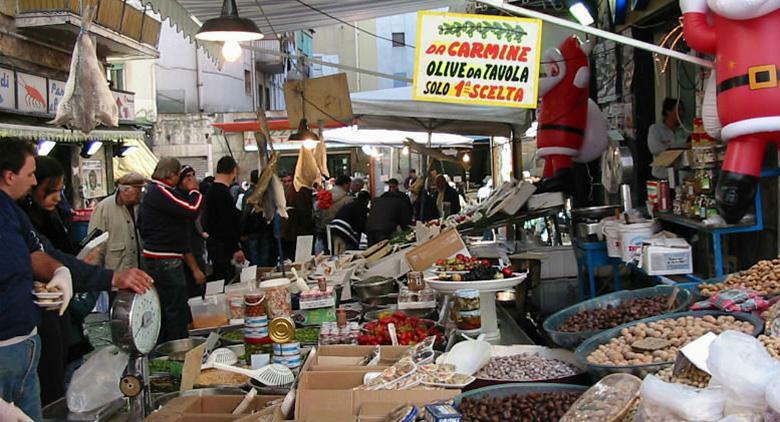 Go straight to via Domenico Morelli until you reach Piazza dei Martiri. 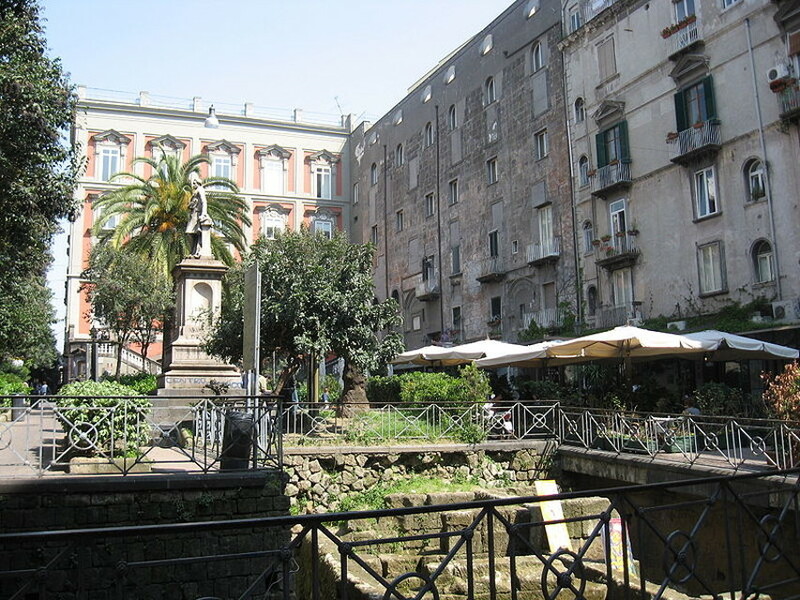 Go across the square and turn on Via Carlo Poerio and get on Piazza San Pasquale. Keep going walking through Chiaia Riviera, go straight and turn right at via Bausan. You can continue your walking in Piazza San Pasquale, but via Bausan has a very nice stairway, perfect for your daily keep fit exercise schedule. at first, in the past, via Salvator Rosa was called “l’infrascata” because of two reasons: grasses and tree; probably, a big grass decorated the old restaurants’ entrace in Via Salvator Rosa. at last, this street was also called “salita dei ciucci” in cause of donkeys rental. In conclusion, keep going to via Museo, where you can find the National Archeological Museum. Stop for a while and ask for some information to visit it or keep walking in via Costantinopoli and relax on a bench in Piazza Bellini.